Next: Next post: British Rail no.99013 – withdrawn in 2017! 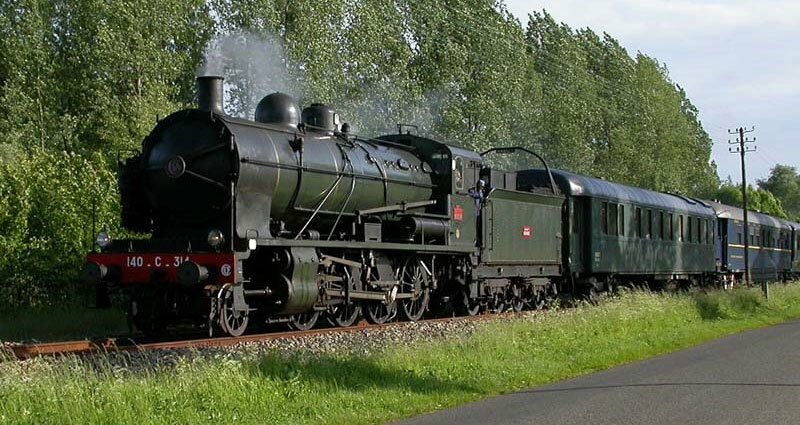 1st and 2nd July 2017 sees a special event at a heritage line in northern France which will be of interest to British enthusiasts. The Chemin de Fer Touristique du Vermandois (CFTV) is based at Saint-Quentin, roughly a third of the way between Lille and Paris, and about two hours’ drive from Calais. The event on Saturday 1st and Sunday 2nd July 2017 celebrates the CFTV’s 40th anniversary, and of the most interest to the British haulage enthusiast will be the steam and diesel shuttle trains that will run between St-Quentin-Gauchy and Mézières-sur-Oise, and between Mézières-sur-Oise and Ribemont. The first departure from St-Quentin-Gauchy will be at 10:00 and the last from Ribemont at 17:00. A day ticket costs €15 and a weekend ticket €25; discounts available for online purchase here. Trains will be handled by North British 2-8-0 steam loco 140-C-314, built in Glasgow in 1917 and celebrating its centenary, and BB66252, a 1,100hp single-cab diesel-electric built by Alsthom in 1967. Originally it had been hoped and advertised that BB64066 and BB67456 of the Cellule de Matériel Radié (CMR) of SNCF (effectively its “heritage fleet”), but these machines cannot now attend. Mézières-sur-Oise station will also see a display by the Association 14-18 en Somme, and 11:00 on the Sunday will see a commemoration of the war dead with flag bearers. This area of France, of course, has World War 1 history everywhere you look, and it is great that this is remembered 100 years on. More prosaically, but still of interest, Ribemont will host a model railway exhibition and a display of classic cars. Very helpfully, the CFTV have an English-language “how to get here” section on their website, telling you everything you need to know. Link here. It sounds like a really interesting event!